I hate selfies, I do them but to get the double chin out of the picture I need to grow longer arms. I don't have a selfie stick, nor will I buy one. I tend to ask random passers by to take pictures of me on my phone. Selfies just for the sake of taking them drive me up the wall, however I do love ones where the background image is captured, other wise you just may as well go to a passport photo booth if there is nothing to show in the background. I just love how a woman was turned away at the Arsenal game on sunday for having a selfie stick on her. 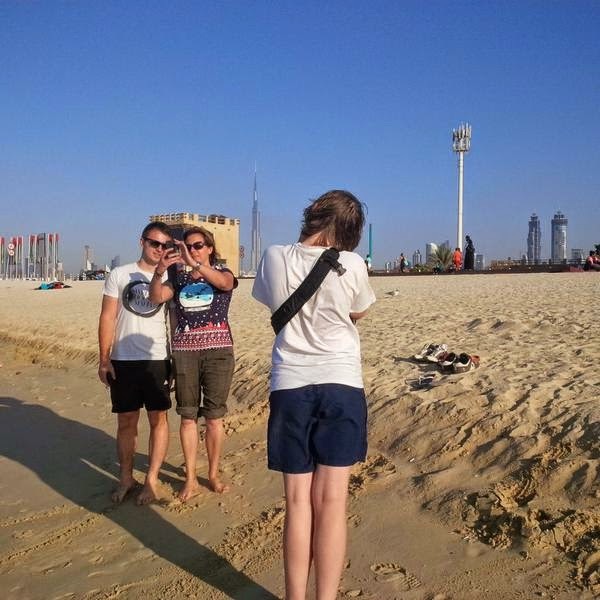 I am surrounded by selfies and sticks here in Dubai, everyone is at it, more than I've ever seen anyone do, but please I really do wish people would chose their surroundings a bit better. I'm currently sat at Dubai Marina, with the Cayan Tower in front of me, yachts in the harbour, flowers, water fountains. It truly is beautiful, but the couple next to me, sitting against the wall are taking endless selfies when if they just turned around they'd have a beautiful picture of themselves in beautiful surroundings, rather than an image that looks like it's been taken in one of those photo booths. Do you pout and make your mouth look like a cats arse? I never used to have my picture taken, because I never liked how I looked. Then I realized my kids wouldn't have a picture when I'm gone, so now I take selfies making sure the double chin is hidden.